Sporadic clashes erupted in parts of western India on Saturday as police detained the popular leader of a farming caste group after denying him permission to hold a rally. Large groups of Hardik Patel's supporters blocked roads and held sit-ins to protest their leader's detention. By Saturday evening, police had to use batons and tear gas to disperse a crowd of about 3,000 supporters in the region's largest city, Ahmadabad. In retaliation, protesters pelted the police with stones. There were no immediate reports of casualties from the clashes. When Patel was detained after a similar rally last month, riots erupted across several cities in Gujarat, leaving at least five people dead. Patel had been detained in Surat on Saturday morning and placed in a police van as thousands of his supporters looked on. Surat is a diamond cutting and polishing hub in Gujarat state. "The Gujarat government wants to silence our voice. The government and the state police wants violence in the state," Patel told reporters as he was being driven away by police. 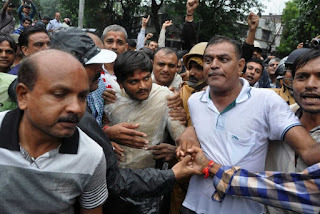 Surat Police Commissioner Rakesh Asthana told the Press Trust of India news agency that the 22-year-old leader and a few dozen of his supporters were "detained in the interest of law and order" because they did not get government permission to hold a rally. He said the men would be released later Saturday after Patel's supporters were dispersed. Ahead of Patel's detention, the Gujarat state government banned mobile Internet services to prevent protests and rumors from spreading. The ban remained in place late Saturday. A U.N. refugee agency spokesman says the UN estimates that 80 percent of the people entering Europe through the Balkans are from Syria, Afghanistan and Iraq. Babar Baloch, a Budapest-based spokesman for the UNHRC, told The Associated Press that most are Syrians but he could not give a precise estimate. He said the other 20 percent are from places including Pakistan, Bangladesh, Burundi and sub-Saharan African. Baloch could not say what percentage of those entering Europe would have legitimate claims to be refugees. He said Syria, Afghanistan and Iraq are obviously "refugee-producing countries" but people from the other countries could have a legitimate cause to claim refugee status if they are persecuted at home. Macedonia's interior minister says "a consistent European approach is needed" to solve the continent's migrant problem. Minister Mitko Cavkov accompanied EU enlargement commissioner Johannes Hahn on Saturday as he toured a migrant camp in Gevgelija, on the southern border with Greece, where about 5,000 people are passing through daily on their way to Serbia and more prosperous European countries. Cavkov says "we are worried, because of the closure of the borders, for migrants in the north." Macedonia's parliament on Friday extended a state of emergency on the country's northern and southern borders until mid-June next year due to the refugee crisis. Police say more than 83,000 migrants have passed through the country in the last three months — part of more than 300,000 this year. Slovenian police say more than 1,500 migrants have entered the country while 600 more are waiting at the border crossings with Croatia to get in. Police said Saturday that one third of the registered refugees said they were from Syria and another third from Afghanistan. The rest say they are from Iraq and various other nations in the Middle East, Asia or Africa. Slovenian Interior Ministry official Bostjan Sefic says that "police are fully in control and the security situation is good." Most of the migrants want to pass through Slovenia further toward Western Europe. Slovenian media say about 250 people have headed on foot toward Austria from the refugee center in the city of Maribor in the northeast of the country. More than 20,000 have entered Croatia since Wednesday. In the Hungarian town of Szentgotthard a mere 20 meters separates the migrants from their dream: Austria. Hundreds seeking refuge have been shuttling for days between bordering countries that were unable or unwilling to offer them shelter. Now Hungary has begun bussing some here. Pain and uncertainty drained from the face of Adeeb Jaafri, a theater student from Damascus, as he walked in Saturday. "Right now, I feel like I've been born anew. Even now I don't even see these long queues in front of me," he said. For those who had to wait in Hungary, there was desperation. Hala Khatib of Damascus and her three daughters wept uncontrollably. "Please let me go. I am exhausted. Me and my children, we're exhausted," she said as she waited. Hungary's Prime Minister Viktor Orban has opened up a tourism center at a mountain resort, saying the move is part of the same struggle to defend the nation that has seen him build fences against migrants. Over the past week soldiers and police have sealed off the country's borders with razor-wire fences and jailed dozens caught crossing. Thousands of armed soldiers are at the borders to keep foreigners out. In a televised speech from the Matra Mountains in northern Hungary, Orban said: "We have to defend the country. I don't think we can make any compromise on this. But danger and crisis notwithstanding, we can't ignore our efforts to build up normal life. What's happening here is an important part of nation building. Since we want to defend our lifestyle, we also want to build up our normal life." More than 500 people with Finnish flags have formed a symbolic human wall across a road in the border town Tornio in northern Finland to protest against the arrival of migrants from Sweden. Local police said Saturday the demonstration in Tornio, which is the sole entry point for migrants arriving from Sweden, had been peaceful. A formal registration center for refugees is scheduled to open in the town of 22,000 Tuesday. Up to 30,000 asylum-seekers are expected in Finland this year, compared to 3,651 last year. Tornio sits just south of the Arctic Circle. European Union enlargement commissioner Johannes Hahn has proposed to allocate one billion euros ($1.1 billion) to Turkey to deal with the migrant crisis. At the end of his two-day visit to Macedonia Saturday, Hahn said the bloc needs to help Balkan countries cope with the flow of people fleeing war and poverty in the Middle East and Africa. Hahn toured the camp in Gevgelija, on the southern border with Greece, where about 5,000 migrants are transiting daily on their way to Serbia and more prosperous European countries. In a routine procedure with a now smooth process of registration, migrants are allowed to board trains, buses or taxis heading to the northern border with Serbia. Macedonian police say more than 83,000 have transited through the small Balkan nation in the last three months. They estimate that more than 300,000 have passed through this year. Croatia's prime minister says his government has forced Hungary to let migrants into the country again after sealing off the border with Serbia earlier this week. Zoran Milanovic said Saturday there was no agreement with Hungary to accept the refugees at the border with Croatia, but that "we made them take the refugees by sending people there." He added that "we'll keep on doing it." Croatia on Friday said it was overwhelmed by the influx of thousands of people in just a few days and would be sending them to Slovenia and Hungary. Migrants turned to Croatia on Wednesday after being pushed away from Hungary. Most migrants fleeing war and poverty want to proceed toward the rich countries of Western Europe such as Germany or Sweden. Hungary's military says it is calling up 500 army reservists as it struggles to reinforce its borders against huge numbers of migrants pushing into Europe. The Defense Ministry said in a statement Saturday that Defense Minister Istvan Simicsko ordered the reservists to report "due to the state of crisis caused by the illegal migrants." Hungary became a major entry point into the European Union this year as many refugees fleeing war traveled to Western Europe. In recent days the country has tried to close off its borders with razor-wire and other tough measures. Still, Hungary had no choice but to allow thousands into the country on Friday after Croatia could not cope with huge numbers there. Hungary has been transporting them to Austria. The government has deployed thousands of armed troops to the border as the country has imposed a state of emergency in border areas. A top general, Tibor Benko, said the reservists are former soldiers who will mostly fill in for active-duty soldiers to keep normal operations going in barracks, though some could also be deployed to the border. Croatian police say 20,737 migrants have entered the country since Wednesday on their journey toward the rich nations of Western Europe. Police said Saturday more people are coming in from Serbia, mostly near the eastern border town of Tovarnik, where there are already 2,500 people waiting for transport. The Croatian government said Friday it was overwhelmed by the influx and would be sending people toward Slovenia and Hungary. 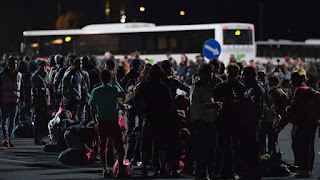 Migrants are being transported by trains and buses toward the borders with the two neighboring countries. Most of the migrants, who are fleeing war and poverty in the Middle East and Africa, want to go to Germany or the Scandinavian countries. Austria said Saturday 6,700 people have arrived there since midnight. Right-wing rioters have protested in front of a new asylum shelter in the eastern German town of Bischofswerda, throwing a bottle at a bus arriving with refugees and shouting racist slurs at them. The German news agency dpa reported Saturday that around 100 rioters tried to block the road to the asylum shelter and that police had to protect the refugees from them as they entered the building late Friday. It was the second night in a row that Bischofswerda, east of Dresden, witnessed protests against the asylum center. Last month, dozens of police were injured when more than a hundred right-wing extremists attacked a refugee home in Heidenau, south of Dresden. After the riots, German Chancellor visited the shelter and met with refugees, officials and volunteers. Slovenian police say more than 1,000 migrants have entered the country and hundreds more are camping on the border crossings with Croatia waiting to pass. Police said Friday they were processing the migrants and placing them in refugee centers around the country, although most migrants have said they want to go further toward Western Europe. As temperatures dipped overnight, hundreds of migrants at the Obrezje crossing set up tents camping there without food and water while Slovenian police allowed limited numbers in. Migrants also have been going in at the Harmica border crossing where riot police Friday evening pepper sprayed about 500 migrants on a bridge along the Croatian border. Police say pepper spray was used because refugees were throwing bottles and sticks on police and pushing them. A Greek coast guard spokesman says a 5-year-old girl who was retrieved unconscious from the sea off the Greek island of Lesbos has died in hospital. Nikos Lagadianos says a coast guard vessel rescued 10 other migrants from the same boat, while one managed to swim ashore, and 14 are still missing. Lagadianos said survivors told authorities a total of 26 were on the boat, which sank when water leaked into it. The search operation continues. The migrants' nationalities were not known yet, the spokesman said. The vast majority of the over 300,000 migrants who have crossed into Greece in 2015 are Syrians and Iraqis. Croatia's president is demanding reassurances from the European Union that it will help her small country deal with the influx of migrants. In an interview with The Associated Press early Saturday, President Kolinda Grabar Kitarovic said that the country of 4.2 million people needs to be realistic about what it can do about the thousands fleeing conflict and poverty in the Middle East and Africa. The migrants and refugees want to transit Croatia in hopes of seeking asylum in more wealthy Western European nations, such as Germany. "We need to stop the flow, we need to get reassurances from European Union what happens to these people who are already in Croatia, and those who still want to transit through Croatia further," she said. Police say 6,700 migrants have arrived in Austria since midnight after Hungary started escorting people to the country's border. Police spokesman Helmut Marban said Saturday about 4,200 people crossed the border at Heiligenkreuz, near the southern city of Graz, while the rest used the Nickelsdorf crossing near Vienna. Police say border controls continue to be in place, with vehicles being selectively checked and those inside asked for valid travel documents. Thousands of migrants, many lacking food and water, remain trapped in southeast Europe after countries began putting up barriers that have blocked their passage to Western Europe. On Saturday, Hungarian authorities were escorting hundreds of people to the border with Austria after Croatia became overwhelmed and dumped them on Hungary's doorstep the day before. It wasn't yet clear how Austria would react to the large influx of people fleeing conflict and poverty in the Middle East and Africa. In Slovenia, hundreds of people camped out overnight in Obrezje, a town just across the border from Croatia. Authorities only allowed limited numbers of families with women and children to continue on. Many migrants put up tents while others tried their best to keep warm as the temperatures dipped overnight.